We create tailored wedding packages to suit exactly what you want for your wedding day. From canapes and drinks receptions, to afternoon tea and buffets, sit down meals and BBQs /Hog Roasts, and of course our fully licenced mobile bar. As a full service catering company, we also take care of the additional requirements an event requires - so you needn't worry about contacting a multitude of suppliers. We know that when it comes to planning a wedding there are so many factors to think about, it can feel as though your head is spinnng. We are here to make your day stress, hassle and worry free and it all comes as part of the service. On the day, not only do you get skilled chefs and brilliantly supportive waiting staff you also get a dedicated catering co-ordinator who not only keeps your day running smoothly, but also provides a source of ideas, support and advice. We will work with your vision and ideas. Whether that be an elegant afternoon tea on vintage china, a fun and enjoyable bbq or sophisticated three course meal. Some couples know exactly what they want from their wedding day menu, and others need help in deciding. Whichever you are we can help. Kampai Cocktails is one of the UK’s leading mobile bar hire companies based in Brighton. We offer classic and original cocktails using the finest selection of spirits and liqueurs with fresh seasonal fruits, herbs, spices prepared with style and attention to detail. We pride ourselves on style and consistent high quality friendly service, providing the whole experience for your big day. We love what we do and we are dedicated to making your day truly special with our fresh & delicious cocktails and friendly & professional service! 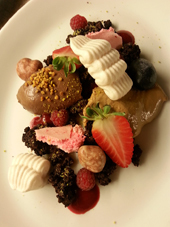 When love is all around Sussex Chef will provide the most sumptuous food beautifully presented and served for all your wedding guests to enjoy. Our friendly staff will help make your special day run smoothly and ensure that all thoughts really are with the bride and groom! A truly luxurious catering experience with attention to detail, a relaxed atmosphere and amazing food is what will make your perfect day one that you will remember and treasure forever. We are happy to provide a personalised menu and price so please do not hesitate to phone or email Clare and Ben with your requirements. Special Offer: Mention the Big Gay Wedding Directory when making your catering booking and receive free bar hire! The Tinderbox is our beautifully hand crafted award winning teardrop trailer, bespoke built to carry our traditional wood oven.We can create a menu to suit you and your guests, from authentic Italian stonebaked pizza, succulent slow roasted organic meats, wood roasted whole salmon, or delicious warm fruits perfectly baked and served with crumble and a dollop of cream! We’d be delighted to spoil you rotten on your big day! We are timeless in our efforts to earn your loyalty and trust, and deeply believe in diversity and the creativity that flows from the many backgrounds and experiences of our clients, guests and employees. With an imaginative and flexible approach we aim to create something personal to you as a couple. We can be as involved as you need us to be, from customising and cooking your menu to full wedding planning. 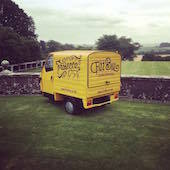 Mrs B’s Caring Catering is an outside catering company based in Frome, Somerset. 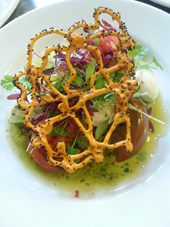 We can catering for any small finger buffets up to large 5 course dinners covering a 40 miles radius of Frome. We normally suggest arranging a meeting to go through everything, getting all your details and requirements. We can discuss your plans and what you would like, giving you some options, ideas and services we can provide, working together with your theme and budget. Jacob & Tori Caterers are wedding catering specialists in the North East, covering areas such as Newcastle, Northumberland, Durham, Teesside and Sunderland. Easy Gourmet are specialists in providing the ultimate wedding reception. With 15 years of track record, we have not only catered for but also planned, designed and themed countless weddings for our clients. Easy Gourmet’s cuisine takes inspiration from the seasons and combines the very best British produce with French flair and a dash of sunny Mediterranean flavours. Traditional Fish and Chip mobile catering unit for hire. We supply delicious and mouth watering fish and chip suppers with alternatives for non fish eaters and vegetarians, all served with mushy peas, condiments, cutlery and serviettes. We cater for any occasions including weddings, civil ceremonies and parties to name a few. We only use the highest quality produce at very reasonable prices. Let us take the stress off your special day and give your guests a truly British treat! We are Glasgow Catering Services. Gordon Yuill & Luke Tracey. We have been at the forefront of Glasgow catering for a while now and are taking our expertise and impeccable attention to service and detail to launch our new service which can source and provide everything you need for a stress free event. Gordon Yuill is one of Glasgow’s most renowned restauranteurs and is best known for running Rogano. Luke Tracey has excelled fast in career and had been running successful high end restaurants and hotels from a young age. Barman, or a team of them. Waiter, or a squad of them. One chef or a complete brigade, and us! We are fully experienced with all aspects of wedding planning and catering. We have provided full catering services for numbers into the many hundreds in all sorts of locations and conditions. We will design and produce the perfect wedding for you. Our aim is to offer you as much flexibility required to make sure that your special day is one to remember for all the right reasons. We offer an affordable catering service where no detail is left to chance giving you the service you deserve. Cupcake Packages, favours & Carat’s Candy Corner services also available. 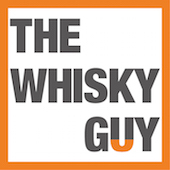 Scotland’s leading mobile bar company providing its clients with quality service from some of Scotland’s most skilled cocktail bar staff. BadaBoom provide its clients with their top of the range custom mobile bar units which can be set up in any location in minutes. Rather than a tresle table with a linen, BadaBoom will create the ambience of a classic cocktail bar or a showcase bar with our flair bartenders. 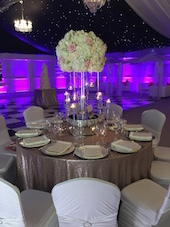 When it comes to catering for your special day ‘Regis Banqueting Ltd’ are at the forefront of Wedding Catering Businesses. Having catered for over 100 weddings we pride ourselves on our highly experienced staff, menu variety and flexibility to cater for clients individual needs and wants for your big day without the exceptional price tag! The perfect ingredients for your perfect day… Working with you to tailor your wedding reception to your exact requirements, making sure that every detail is perfect, meaning you can relax in the knowledge that everything is taken care of. 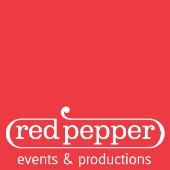 We are all about the detail here at Red Pepper Events. We know that sometimes you might not need our event management skills, but you still need a little bit of help crossing everything off your to do list. We offer a wide range of quality hire items, everything from crockery and glass wear to linen and marquees. We are a company called Dorset Fine Dining offering a personal, creative catering service for all kinds of parties and events, whether it be canapes and champagne, an intimate fine dining experience, civil ceremonies, wedding catering or a delicious bbq menu, we cover it all. 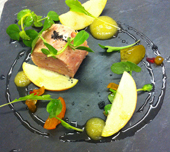 Dorset based chef Nick started cooking more than twenty years ago. After leaving school he took a three year Advanced Cookery Diploma at Thanet Technical College in Broadstairs. During his time at the college he worked at Buckingham Palace at several functions and also had a part-time job at Wallets Court Country House Hotel, Kent. Here he learned invaluable classical French cooking techniques as the chef owner, Chris Oakley, was the first British chef to gain a Michelin Star under the Roux Brothers at Le Poulbot. This is where his passion for cooking really took off. He also spent some time at a catering college in Rheims, France. After finishing college Nick travelled to London to work at the Hilton on Park Lane and then returned to Wallets Court in Kent, gradually working his way up to the position of Head Chef. Here he helped to gain 3AA Rosettes along with Chris Oakley. He stayed for several years until he decided to widen his experience by travelling to Ireland where he worked in several quality restaurants learning new techniques and gaining more knowledge.